BIG ISLAND (Hawaii) (Sputnik) - The residents of lower Puna district on Hawaii’s Big Island should be prepared to evacuate at any moment amid the possibility of an explosive eruption of the island’s Kilauea volcano, the Hawaii County Civil Defense Agency said in a statement on Saturday. "Residents of lower Puna between Kapoho and Kalapana, are advised to be on the alert in the event of possible gas emissions and volcanic eruption. There may be little to no advance notice to evacuate, so take this time to prepare," the statement, published on the Hawaii County Civil Defense website, read. — Kali Yuga | Apocalyptic News (@NewsKali) 12 мая 2018 г. 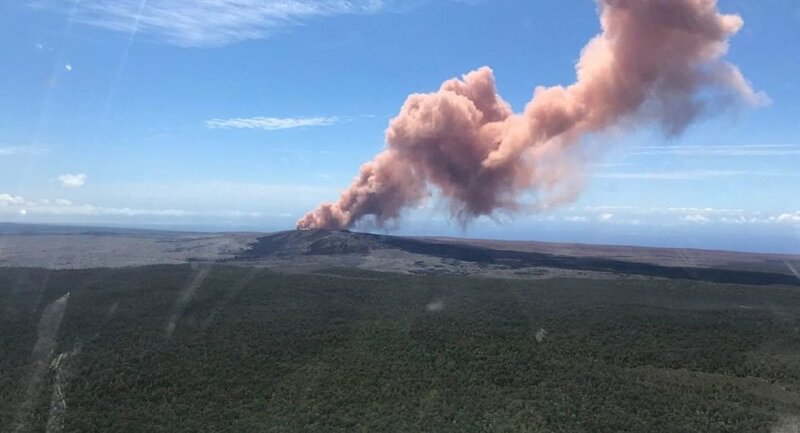 The major Kilauea volcano eruption started on May 3 prompting evacuations in the Puna district which is home to around 10,000 residents. The US Federal Emergency Management Agency (FEMA) said in a press release earlier on Saturday that US President Donald Trump had approved a major disaster declaration for the state of Hawaii, providing state and local authorities with federal assistance in their recovery efforts in the areas affected by the ongoing eruption of the Kilauea volcano. "Federal funding is available to the state and eligible local governments and certain private nonprofit organizations on a cost-sharing basis for emergency work and the repair or replacement of facilities damaged by the Kilauea volcanic eruption and earthquakes in Hawaii County," FEMA said in the release. — Massimo (@Rainmaker1973) 12 мая 2018 г.
Willie Nunn, the FEMA federal coordinating officer in the affected area, said that "additional designations may be made at a later date" depending on further damage assessments. The funding was disbursed to the Hawaii authorities after Governor David Ige signed a disaster declaration request on Wednesday. The governor's office said the estimated cost to protect residents over the next 30 days would likely exceed $2.9 million. — EarthSky (@earthskyscience) 12 мая 2018 г.
Ige expressed his gratitude to the federal authorities as his request for a Presidential Disaster Declaration had been approved. The US Geological Survey’s Hawaiian Volcano Observatory said Friday that the withdrawal of lava from the summit lake of Halemaumau crater could lead to a steam-driven eruption. The observatory noted that such an eruption could generate ash plumes as high as 20,000 feet, which would affect the area of up to 12 miles. The biggest danger from such an eruption is ash fallout, according to civil defense. The observatory said that 15 fissures, which have emerged since May 3, have not produced any lava since Wednesday. — ╰☆ 𝐁𝐮𝐝…★ ★ (@bud_cann) 12 мая 2018 г. However, lava previously emitted from those openings has reportedly destroyed 36 structures, including over two dozen homes, and covered 117 acres of land. The recent volcanic activity in Hawaii has also caused countless earthquakes, including a magnitude 6.9 earthquake on May 4m which was the strongest earthquake to strike Hawaii since 1975.